RAM did it with Paul Harvey. Apple did it with Walt Whitman (by way of Robin Williams). Visa did it with Amelia Earhart. Now, it's BMW's turn to use the poetic words of a long-ago visionary to sell a modern product. The automaker is using a recording of Arthur C. Clarke to celebrate the promise of the future, as realized today by the new BMW i series of electric cars. 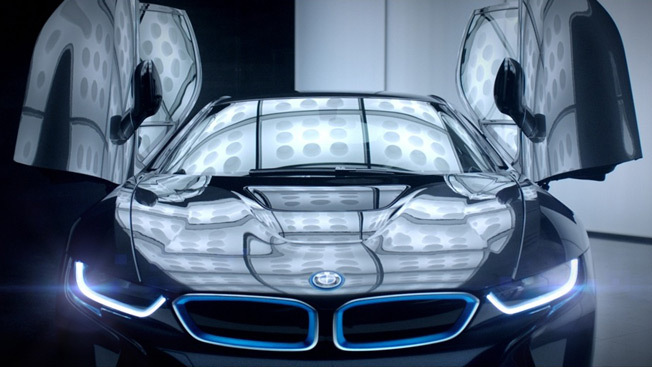 "Trying to predict the future is a discouraging and hazardous occupation," Clark says in the audio recording from 1964 which serves as the voiceover for BMW i's 60-second launch spot, "Hello Future." The ad, by Kirshenbaum Bond Senecal + Partners, will break Friday night during NBC's coverage of the opening ceremonies of the Winter Olympics in Russia. Clark goes on: "If by some miracle a prophet could describe the future exactly as it was going to take place, his predictions would sound so absurd that people everyone would laugh him to scorn. The only thing we can be sure of about the future is that it will be absolutely fantastic. So, if what I say now seems to you to be very reasonable, then I will have failed completely. Only if what I tell you appears absolutely unbelievable have we any chance of visualizing the future as it really will happen." Stylized, futuristic images of cityscapes, drenched in blue tones, pass one after another before the spot shifts to showing one of the i vehicles, which preens by opening its scissor doors like wings—and is then seen speeding along a darkened tunnel. Two other 30-second spots, for the i8 plug-in hybrid and the i3 all-electric city car, have a bit more of a narrative. The i8 spot, "Sightings," shows people trying to describe something they've never seen before (of course, it's the i8), while the i3 spot, "SHHH," features a boy who takes his dad's i3 for a joyride with a girl (played by Olivia Crocicchia of Rescue Me) but gets caught in the end thanks to his dad's BMW i Remote App. "It is a rare and exciting opportunity to launch a new brand and for BMW i, one that requires a world stage," said Trudy Hardy, vp of marketing for BMW of North America. "We look forward to making a bold statement about the future of sustainable mobility." BMW is going all out for the Olympics. It will also be running digital shorts for the BMW i on NBCOlympics.com, and airing spots for the all-new X5 SUV and its first-ever BMW 2 Series. The automaker also completely redesigned the two-man bobsled that will be used by Team USA this month.